Hopkins is looking to make a few high-traffic streets of Charles Village a bit more complete. Starting this week and running through 2019, a stretch of blocks along St. Paul and E. 33rd streets will almost assuredly become a thorny obstacle course of road work and other construction. But once finished, Johns Hopkins University says it’ll be a more “vibrant, walkable retail district” catering to the students and residents in the area. 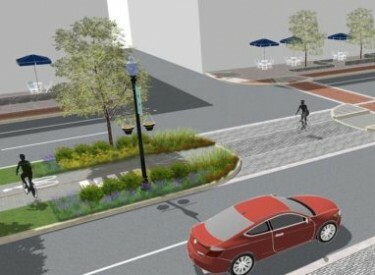 The university today announced its “streetscape” plan for St. Paul Street between 31st and 33rd streets, as well as 33rd Street between St. Paul and N. Charles streets, which involves adding new raised (and landscaped) medians featuring walking and bike paths, brick crosswalks, lighting, benches, and trash and recycling receptacles. It’ll also require new signals, curbs, electrical work, lane reconfigurations and paving, to be done in phases ending in December. Besides making the area more pedestrian-friendly, the stated goals for the project include enhancing the intersections, maintaining two-way traffic, creating a better “gateway” from the east gate of Hopkins-Homewood to retail in Charles Village, and adding more curbside parking for businesses. The university said it worked with the city’s Department of Transportation, businesses and community groups on the design. It follows other projects from past years like the $28 million reconstruction of N. Charles Street, the renovation of San Martin Drive carving between Homewood and Remington, and the construction of the mixed-use Nine East 33rd building, which sits along one of the blocks affected by the streetscape project. The trails on the redesigned median on E. 33rd should help connect pedestrians–including scooter riders–between Charles and Saint Paul, he said, and should also help to slow traffic and ease crossings for cyclists and pedestrians, he noted. The Charles Village Civic Association, neighbors and merchants have been attending meetings about the streetscape plan for three years, according to CVCA board and land use committee member John Spurrier. “While the construction and parking restrictions create a minor inconvenience this year, it is good to see efforts that began with the establishment of the North Charles Village Planned Unit Development over [two] decades ago coming to fruition,” he said in an emailed statement. For drivers, the changes will require modified lanes through the rest of the year, in additions to lots of roadwork. Construction will happen in largely four-to-six-week phases for the rest of the year, detailed here. For pedestrians, it means the relocation of an MTA bus stop on St. Paul Street, currently located north of 31st Street, to the opposite side of St. Paul Street. And in two weeks, the city will relocate a Circulator bus stop on St. Paul from just north of 32nd Street to 33rd Street, just west of St. Paul. Hopkins is working with RK&K as the civil engineer and Design Collective as its landscaping consultant.